The area is the size of a two-dimensional closed surface (the number of unit squares that cover the surface of the figure). The area is measured in square units. We can use mm², cm², m², km², inches², yards², miles² or any other length square unit. We can find the area counting the number of square units. The area of the following rectangle is 6 square units. 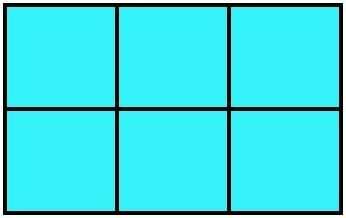 The number of unit squares in each row is the length of the rectangle. A parallelogram is a quadrilateral with two pairs of parallel sides. 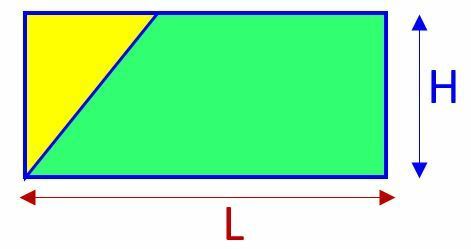 The base length is L and the distance between parallels is the height H.
We can transform a parallelogram into a rectangle, removing the right-angled triangle on the right and adding it on the left, as shown. Always remember that length and height must meet at a right angle. A rectangle has two diagonals (line segments linking opposite vertices). Each diagonal divides the rectangle into two congruent right triangles (each with half the area of the rectangle). 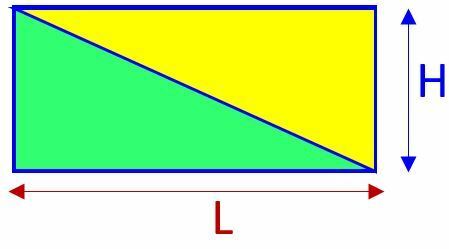 If we cut a rectangle in half diagonally we have two congruent right triangles. The area of each triangle is ½ length × height.